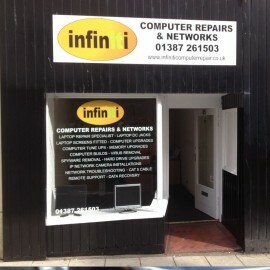 We are a computer repairs shop operating in Dumfries. We pride our self in our “thinking out of the box” attitude. We aim to provide cost effective solutions to computer and network problems. Quality is paramount with us. We believe that customer service and a high standard of quality is crucial and with every laptop or computer repair project we work on, we aim to provide a fast, reliable and affordable service. With computer repairs, a methodical approach is the best way to resolve any issue that may arise and our team are fully trained in resolving a wide range of issues. We provide a guarantee that every repair job we carry out will provide you with complete customer satisfaction and we are always happy to provide feedback or advice on how to get the best from your machine. At Infiniti Computer Repairs, we aim to offer the highest possible computer repairs service possible and to do this; we ensure all of our employees regularly undergo training. You can rest assured that all of our team are fully qualified and anyone working on your laptop or computer will have experience and the knowledge to get your machine working or working better. We are conveniently located in the town centre so if you are looking to drop your computer or laptop off, we are in easy reach. If you are unable to make it into Dumfries town centre, we can provide an out-call service to your home or office. At Infiniti Computer Repairs, we have the flexibility to work around you and if required, we can provide evening and weekend assistance. Rather than waiting for a problem to emerge with your computers, using our managed service contract can help to ensure your business operates smoothly and doesn’t have to deal with any disasters! Most firms are wholly reliant on their computer system to provide customer support and to carry out work so losing your computers, even for a few hours, could cause problems for your business. Our managed service contracts see us providing regular check-ups and services on your computer network which can help to minimise the problems that lead to major computer breakdowns. If you need your business to be online and operational at all times, our maintenance work will provide you with the confidence you need. Losing your files and data may seem like the end of the world but with fast computer repair Dumfries support, all is not lost. We have a strong track record in being able to recover files you assumed were lost, giving you peace of mind and another chance to create a backup system. We strongly recommend customers use a backup system for their files and even after we recover your data, we can provide you with advice on how to utilise free backup storage solutions. While we are known for providing a reputable customer repair Dumfries support solution, with remote support solutions, we can resolve your computer problems no matter where you are. Our trained team members, with your permission, can take access of your PC or laptop to make the changes which will improve security, recover lost files, ensure your PC runs better or just help to ensure that there are no nasty surprises waiting for you. We are always happy to help out in the Dumfries and wider area and if your business requires onsite support for their computer network, our team are on hand to come to you and give you the help that you need. It can be all too easy to allow viruses to derail the performance or security of your machines but with our support, you can have a virus free machine and you can minimise your risk to future virus attacks. Staying safe is crucial and our team will help you to stay secure and virus free.